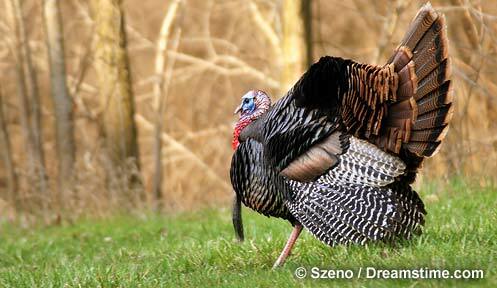 Create some Wild Turkey Habitat! For more information on obtaining Wild Turkey & Wildlife Habitat Improvement Package (for use anywhere in the state), as well as an annual Conservation Plant Sale (descriptions of Evergreens, Trees, Fruits, Shrubs, Groundcover, Flowers, Seeds, Composters, Beneficial Bugs for sale), visit the Strafford County Conservation District website. The NH Fish and Game Department discourages people from purposefully feeding turkeys because doing so enhances the likelihood of disease, predation, and human conflicts. Fish and Game does not provide turkey feed or compensate individuals for the cost of turkey feed. The Department does participate in qualifying cost/share projects intended to enhance turkey habitat. Good habitat management practices that result in the production of winter persistent fruits, seeds, and grains, can enhance the value of your land to wildlife and eliminate the need to feed. BE ADVISED that irresponsible wildlife feeding can result in: the spread of disease and parasites; increased rates of predation by wild and domestic animals; human habituation by wildlife and resulting animal nuisance problems, and; the illegal taking of wildlife. DO NOT feed turkeys unless there is 15 or more inches of soft powder snow on the ground for a period of 10 or more days. Doing so is wasteful and unnecessary. DO NOT feed turkeys during spring or fall or during the winter when there is incomplete snow-cover or patches of bare ground. DO NOT feed turkeys within 100 yards of an occupied dwelling, adjacent to busy roads, in areas of high visibility, in residential areas or in areas where pets, predators or vehicles pose a threat to traveling or feeding turkeys. DO NOT treat turkeys in such a way as to diminish their natural wariness of humans; keep human contact to a minimum. DO NOT feed wild turkeys in areas that facilitate contact with game-farm turkeys; doing so will result in cross-breeding and diminished wildness in our native birds. DO NOT forget that wild turkeys are a public resource; turkeys range widely (over several square miles) and are hunted throughout the state, where biologically sustainable. FEED turkeys cracked or whole kernel corn, sunflower seeds, oats, wheat, or non-medicated commercial poultry or turkey rations. FEED turkeys daily by broadcasting food at a rate of 2 large handfuls (or 1/2 cup) per turkey per day. To ensure a good distribution of food among flock members, spread it out so that all birds have an opportunity to feed. FEED turkeys until the flock ceases daily visitation or until severe conditions moderate. FEED turkeys where you have observed turkeys feeding naturally in the past. Preferably this is in close proximity to winter roost sites (often pine stands). Doing so minimizes movement (and energy expenditures) between roost sites and feed sites.